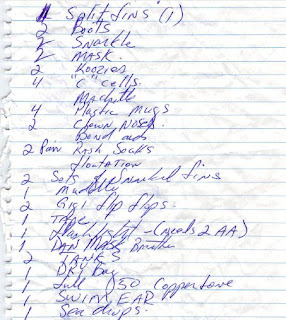 This is "the list". I thought I lost it. It is all my worldly possessions on St Croix plus 28 pounds of dive weights. Now for a little insight. This is my typical handwriting. I am down to just 2 clown noses...need to reorder. I keep a muddle but don't ever use it, but I might. I really love that dry bag and debate whether or not to leave it there. I am so proud that I now have two scuba tanks down there. I will see this stuff again in 24 days. Koozies, "c" cells and clown noses should not be organized in any manner or form. Knowledge of Koozies in the tropics is as important as sun screen. C Cells are a weight reduction call for my dive light. They are heavy and knowing I have them down there saves me time and weight. A tropical vacation would be incomplete without a clown nose. Not to be used with clown noses, I would guess. 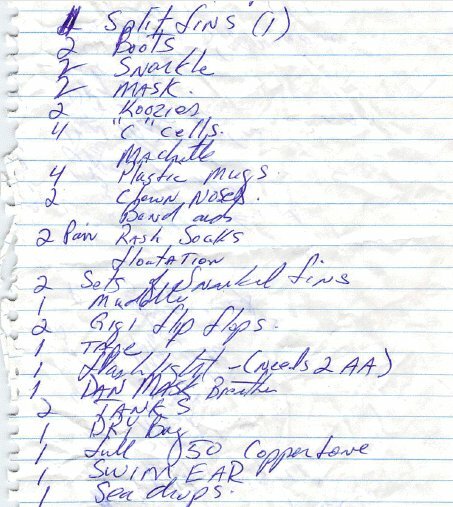 BTW, I'm surprised you would keep such an old-school list of such important possessions. Maybe you should duplicate it electronically in case it gets lost again.